This is the first card of the Emerging Soul Cards. I didn’t plan it this way….it emerged one day while I was nearing completion of the 56 card set. In a most wondrous way, the cards began to form triplets, or as I call them, triunes. I even took a photo at the exact moment that began to happen back in 2011 while staying at the home of friends in Lower Lake, California. I took that photo because I knew something extraordinary was happening in front of me on that kitchen table. As the final arrangement of the Triunes were nearing completion, It occurred to me there would be two cards left over. There were a total of 56 cards and simple math showed me two would stand alone…. not belonging in a triune. Was I supposed to write one more so it would be ‘right’ ? 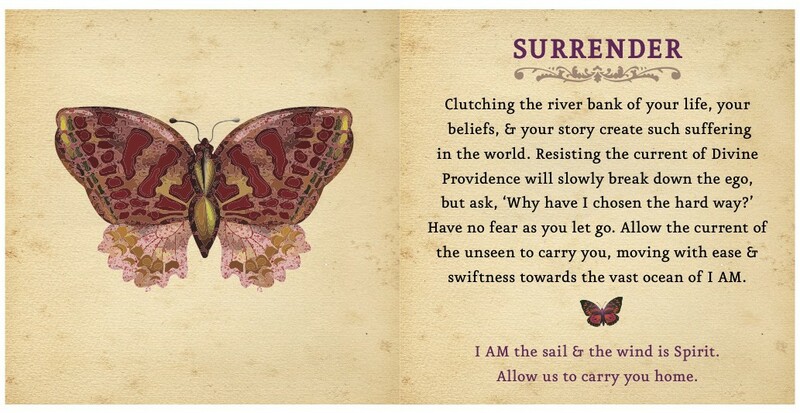 This entry was posted in Emerging Soul Cards and tagged Emerging Soul, IAM, initiation, Inspiration cards, Soul, Surrender on January 22, 2015 by Rebecca Winters Rodriguez.